The 8bit small-computer KC85 -KleinComputer85- has been developed as basis device for an expandable small computer system. The main difference compared to the common home computer is the modular concept which allows to connect special devices and different modules. Due to this concept the KC85 can be adapted to the most different tasks and applications. The basis device KC85 is equipped with a plug-in bus extender. The expansion interface allows to attach one or more extension top boxes. Also there are 2 additional front side slots for plug-in expansion modules. 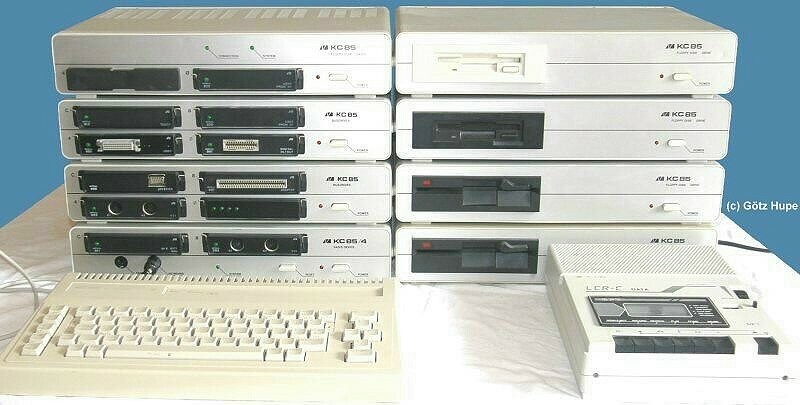 The intend to design a small computer system on a modular base was -at its time 1988- very unique and outstanding. THE MODULAR MONSTER was born. The KC85 BASIS DEVICE works with a U880-CPU 1,77 MHz [Z80-Clone]. 128 KByte RAM built in. 64 k restricted as IRM -Image Repetition Memory-. 64 k free available. Of these, 64 k of RAM, two 16 k blocks are for address 8000H parallel running, by bank switching up to 4 MByte. As well as 20 KByte ROM including: 4 k CAOS C , 8 k CAOS E , 8 k HC-BASIC. CAOS is the operating system of the BASIS DEVICE. CAOS used in text mode 40 x 32 characters. In the graphics mode 320 x 256 pixels, and 4 colors in fully graphic arts mode. In the other modes 16 colors for the foreground -INK-, and 8 background colors -PAPER-. The FLOPPY DISK BASIS has its own U880-CPU 4MHz and 64 k RAM. Under MicroDOS exactly 50 KByte TPA - Transient Program Area- can be used. MicroDOS is the operating system in the PC mode -similar to CP/M-. It can used some function of the BASIS DEVICE with MicroDOS or the newer operating system, called ML-DOS. For example: graphics, color and windows techniques. Even a dual-processor operation is possible. In to this FLOPPY DISK BASIS hidden a GIDE KC-Club version with 2.5 inches HDD -64MB used- and CF-Card as Slave -64MB used-. The 4MByte RAM-Module -see module with 4 LEDs in series- formed a gigantic RAM-DISK Drive A: under MicroDOS . 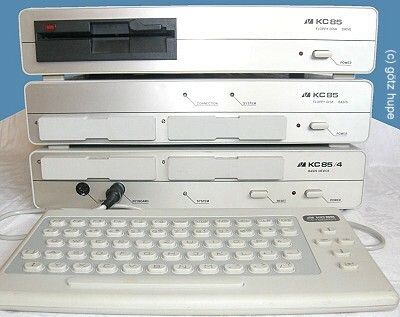 It was in the KC-Club developed, as well as a scanner module with interfaces. Many possibilities are available for development newer hard- and software.